There is increasing interest around the country in documenting patient preferences for life sustaining treatment, with the hope that patients may receive care in line with their goals and values during an emergency. Many states in the US do this through Physician Order for Life Sustaining Treatment (POLST) programs, which are active or developing in all but five states . California has had a law in place since 2008 that mandates honoring a POLST, and on October 1st, 2014, the state will roll out a new version, the first revision since 2011. The changes are subtle, but there are definite shifts in language and emphasis that reflect larger themes. Here we'll take a look at how the new California version compares to POLST equivalents already in use in other states, and what the changes suggest about how attitudes about this important topic are shifting in our community. The POLST is an out of hospital physician’s order that indicates patient preferences for resuscitation and scope of treatment, intended to be completed for seriously ill or frail patients and to be followed by emergency medical providers. The choices for scope of treatment range from full treatment to comfort-focused measures, and in California, patients can also list their preferences for artificial nutrition. To be valid, the form needs to be signed by a physician and the patient, or the patient’s legally recognized decision maker. Why fill out a POLST? The goal of the POLST is to align the care that is provided in an emergency with what would be acceptable to a patient, to make sure that a patient's wishes are honored even when he can't speak for himself. Recent data from Oregon show that patients who filled out a POLST and chose “Comfort Measures Only” were less likely to die in the hospital (6.4%), compared to 34.2% of patients who did not have a POLST form, and 44.2% of patients who completed a POLST and chose “Full Treatment” . What’s new in this version and how is it compare to other states? 1) The order of options in the first two sections has changed. Previously, Section A gave options “Attempt Resuscitation/CPR,” followed by “Do Not Attempt Resuscitation/DNR (Allow Natural Death)." In Section B, the first choice was the least aggressive, “Comfort Measures Only,” followed by “Limited Additional Interventions” and “Full Treatment.” Now, to be more consistent, Sections A and B both proceed from most aggressive to least aggressive. Does order matter? As previously discussed on GeriPal, when the “default” choice on an advance directive presented to seriously ill patients was comfort care, with the option to strike this out and choose full code instead, 80% of patients stuck with the default choice, compared to 61% who chose comfort care on a standard advance directive . Though that was a much more deliberate suggestion of a default than simply having a particular option listed first, one can imagine that order might subtly influence decision making, and reinforce our cultural bias that full treatment/full code is the default for all patients. This is an improvement over the previous version, where the descriptions of Section B options focused solely on the type of additional interventions (antibiotics, fluids, intubation) that each option allowed beyond the least aggressive option listed above it. The easy criticism of New Jersey’s approach is that patients are unlikely to know in advance what their goals would be in an emergency, and would likely have different goals depending on the situation. It is impossible to imagine every scenario (“Well, I’d want to be cardioverted if it were unstable atrial fibrillation with rapid rate, but if a piano dropped on my head from the sky, I'd want quality over quantity”). But bravo, NJ, for thinking broadly—everyone is glad to get more of a vision of the patient on the page rather than her feelings about a la carte feeding tubes. 4) The last major change is that section B gives the option of checking a box for a “Trial Period” under the full treatment option. Another exciting development. The concept of time-limited trials is nicely laid out by Timothy Quill in this JAMA article: “an agreement between clinicians and a patient/family to use certain medical therapies over a defined period to see if the patient improves or deteriorates according to agreed-on clinical outcomes” . It may seem obvious that it’s a good idea to check in periodically to see if the plan of care is achieving the patient and medical team’s goals, but it happens surprisingly infrequently in practice. Though checking the box provides very nonspecific direction to future providers, including the suggestion of time limited trials in POLSTs to remind providers to reevaluate after starting a course of action is a terrific idea. And that's a wrap! At first glance, the changes are relatively minor, but one can sense a tectonic shift beneath, with an overall move toward a focus on goals and reevaluation of whether treatments are aligned with goals, rather than such a specific treatment-focused menu. What do you think of the new POLST? Do you think it reflects how you talk about life-sustaining treatment with patients now, and if not, what could make it better? Do you think it will have any effect on how you have these conversations in the future? If you have experience with the other states' versions of POLST, we'd like to hear about that too! 1. National POLST website. Available at: http://www.polst.org/programs-in-your-state/. 2. Fromme EK, Zive D, Schmidt TA, Cook JNB, Tolle SW. Association Between Physician Orders for Life-Sustaining Treatment for Scope of Treatment and In-Hospital Death in Oregon. J. Am. Geriatr. Soc. 2014;62(7):1246-1251. 3. Halpern SD, Loewenstein G, Volpp KG, et al. Default Options In Advance Directives Influence How Patients Set Goals For End-Of-Life Care. Heal. Aff. 2013;32 (2 ):408-417. 4. Quist TE, Holloway R. Time-limited trials near the end of life. JAMA 2011;306(13):1483-1484. Available at: http://dx.doi.org/10.1001/jama.2011.1413. Good post. Thank you. I am thrilled with the changes that are happening in CA, which are similar to ones I and others have been encouraging in other states. While you are correct about Colorado's current form, the new form due to be rolled out sometime in the next 6 months will be much improved. We will have more aggressive treatments first. And our options for Nutrition include short-term only (think Dobhov) vs long term if indicated (i.e PEG). Specifically mentioning "if indicated" IMO is helpful since most of the time it isn't. and some people would proceed with PEG tubes even if they are not appropriate. We also will include the wording to the effect that "Selecting CPR requires FULL Treatment in B" which is critical to avoiding conflict and confusion. And, now that I have seen it, I may see if we can incorporate some of the words in "Selective Treatment" from the CA form! Thank you. Actually, on close review, Joshua, they changed the paradigm a bit. If someone wants antibiotics, etc., they mark the middle one, then they can mark the extra box of "Do Not transfer to hospital" if they want hospice-type care. Very interesting! Oh yeah, I see it. Very cool then…. Thank you for sharing a helpful review of the 2014 POLST. Along with the California POLST Physician Leadership Council, the Coalition for Compassionate Care of California has been collecting and reviewing comments about the form since the revision in the 2011. Your readers can find a variety of resources about the 2014 POLST, along with PDFs of the form in more than 10 languages, at http://capolst.org. We think the new form will make these challenging conversations more approachable and lead to better documentation of goals of care. Thanks for the comments and for reading! Joshua and Andrew, appreciate hearing about your experience with CA and CO POLSTs. It's interesting that Colorado will be expanding the feeding tube section to include preferences about permanent feeding tubes. The artificial nutrition section of the POLST has actually always felt somewhat out of place to me, since the other decisions are about medical care provided in an emergency situation and feeding tubes are rarely an emergency. I would think that no matter what someone puts on a POLST, a decision like a PEG tube would be thoughtfully discussed with a surrogate if it could not be discussed with the patient. And if a patient's clinical status changed enough that he could no longer participate in a discussion about a permanent feeding tube, a preference he expressed while in good health might be an inappropriate starting point for a conversation with a surrogate, if the intervention is offered at all. If it seems to you like it is rarely appropriate, than maybe it shouldn't be presented as an equal weight option with not doing it? Thanks for your question. You can find a lay language guide to POLST in general here: http://capolst.org/polst-for-patients-loved-ones/ , which is all still true for the new POLST. I think the most important difference on the new POLST is the option to check a box that indicates if a patient would want a "trial period" of aggressive measures or life sustaining treatments, that wasn't there before. And there are slightly more detailed descriptions about the choices in Section B, where patients can choose whether they want comfort focused care or unlimited medical interventions, or something in between. 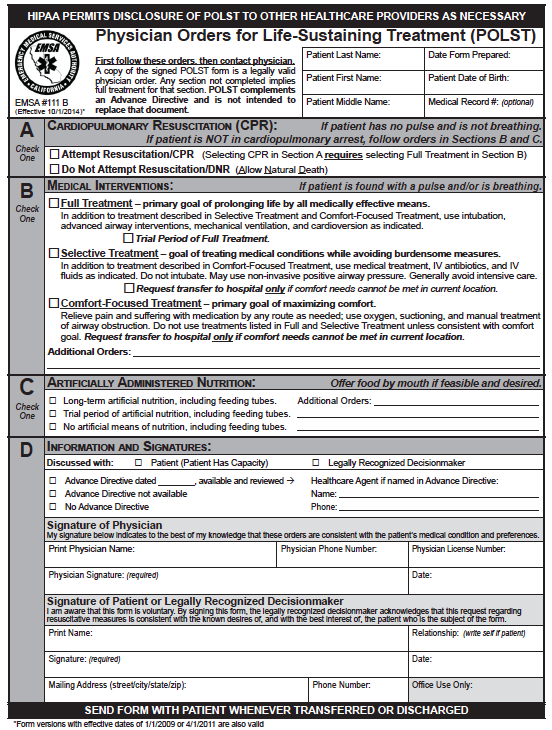 The form remains pretty vague though and should be a starting point for a conversation, both when the patient and doctor are filling it out, and when the patient is sick, and the doctor and surrogate use the form to understand what the patient would want. Hope that helps.